3M Canada has generously offered a prize package of Scotch Brand tapes, adhesives and scissors for one lucky reader of the Corinna Wraps blog! The package includes tons of tape and amazing scissors for making cards and wrapping presents for Valentine’s Day. TO ENTER Ask a question about gift wrapping or share a gift wrapping tip by leaving a comment below. Scotch Pop-Up Tape Handband Dispenser: Super convenient for gift wrapping, it fits right onto your hand so your hands are free to do the wrapping, not wrestling with tape. 2 rolls of Scotch Vellum Tape: Maybe a handmade card with delicate paper is in the cards this Valentine’s Day? If it is, this tape will come in handy! 1 tube of Scotch Quick-Dry Adhesive: Valentine’s Day craft project anyone? Whether it’s a scrapbooking project or a seriously fancy gift wrapping job, this quick-dry adhesive will make it stick. 2 rolls of Scotch Gift Wrap Tape: Tried and true, the satin finish makes this infamous gift wrap tape nearly disappear on most wrapping paper. A pair of Scotch Precision Ultra Edge Non-Stick Scissors: Titanium non-stick scissors for when you’re cutting tape, or are in other “sticky” situations. Giveaway ends midnight EST, Jan. 29, 2012. The winner will be chosen by random draw and will be announced on this blog on Jan. 31, 2012. 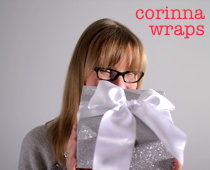 Hello Corrina; Any tips/directions for helping a wrapping paper challenged husband? I have tried but he follows his own path with poor results. Thanks! Thanks for the question, Anne Marie! My question for you would be, Does your husband care? If he’s content dishing up gifts that look like they were wrapped by a koala wearing boxing gloves, then let it be. If he’d like nicer looking gifts, but just can’t master the art of folding paper, gift bags and boxes are easy options. He could also outsource the job by having you do the work 😉 or by having the store at which he bought the gift do the wrapping (many retailers provide wrapping services). What I’m getting at is that he’s the one that has to decide what level of effort he wants to put into wrapping gifts. If he’s determined to get better, practice is the key. Have him read my blog for tips, and he’ll get there! Could you write an article about which tape to use with which type of wrapping paper or wrapping product? I always seem to have the wrong one in my hand…I know there is a way to wrap that makes the tape virtually disappear. Share your secret! That’s a great question, Colleen. I think a post on tapes is definitely called for. Stay tuned! I don’t really have a tip or question about gift wrapping except to say that I seem to have a bit of a knack for it and usually do an OK job of it. This Valentine’s Wrapping & Crafting Giveaway from 3M Canada seems really professional, and I wonder how much the results I get will improve with such glam tools. What is the best way to use cellophane to wrap gift baskets? Mine always look lopsided or have odd gaps. Thanks! Cellophane on gift baskets — that can be a tricky one, Nicole. I think a post on that would be a good idea. Watch for it! Signed up for your newsletter. Thanks! I’d love to learn more about ways to disguise the contents of gifts – there are a couple of people in my family who will pinch, poke, and shake until they know what every gift is before it’s opened (if you want a specific question, though, I’ll go with an easily-guessed gift that I often give kids: how does one disguise the sound of Lego?). Ah, snoopy people. I’m always bummed out when my dad or my husband guess what a gift is before they open it. (And it’s only ever those two who do it.) I don’t understand why they have to guess; just open the gift, be surprised! Perhaps they like the challenge. I often find I spend way more time trying to figure out what paper to use with which ribbons and how to wrap etc. ( I have a rather large supply of material) than I do in the actual wrapping. I am usually happy with the end result however I get bogged down with the planning. Any suggestions? This is a problem, Danielle? Choosing a combination of paper and ribbons is the best part of wrapping! But yes, sometimes getting lost in playing with the colours and patterns can take a lot of time that you don’t always have. You could decide on a go-to combination that will work for most occasions. For example, silver paper with a navy ribbon is appropriate for guys, girls, birthdays, weddings, and more. Stock up on supplies in your chosen colour combo and use that when you don’t have time to play around. Another option, since you say that you have tons of supplies already, is to spend an afternoon playing with your stash and put together “kits.” Select ribbon to go with each paper, tissue to go with each bag, etc., and bundle them together. When it’s time to wrap a gift, grab one of your predesigned kits and wrap away! I love gift wrapping and I live with the world’s pickiest gift wrapping man! We love to wrap gift in craft paper and then dress it up with pretty ribbon. What is your favourite ribbon? Hi Tina! Kraft paper is one of my favourite papers to work with — it’s like the blue jeans of wrapping, a basic that goes with everything. And I love your strategy of using nice ribbons with it, like dressing up jeans with a sparkly top! My go-to ribbons are double-faced satin and grosgrain, because of the extremely wide range of rich colours and option of widths. But my favourite ribbon? That’s a tough one. My favourites usually end up being those little treasures that you find in a fabric store’s notions section, ones that you’ve never seen before, are so unusual, and that you’re unlikely to see again. My gift wrapping tip is to think outside the box. Wrap a gift using newspaper. For the comic or sports lover use that section of the newspaper to wrap their gift in. Use fabric to wrap a gift. Use brown paper bags that you’ve decorated with hand-stamping. Have fun with your gift wrapping and personalize it as much as possible. I love using everyday items to create unique gift wrapping. Yes, I agree, Debra. Sometimes the most interesting wrapping can come from everyday objects. Thank you for your comment! Not so much a question – but I’d love to learn ways to make professional looking bows. I much prefer real ribbon but would love to be able to tie gorgeous loopy bows. Any advice? Hi Marisa! I’m working on creating a few bow-tying tutorials over the next few months, so keep an eye on the blog. Thanks for following up with the tape tutorial!